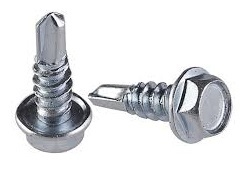 Self-Drilling Screws or "Tek" screws which they are commonly referred to in the industry, are basically tapping screws with spaced threads and a drill point on the end. Self-drilling screws offer economical benefits such as reducing labor and tooling costs as well as reducing or eliminating the need for drill bits and taps. We are your direct wholesale source for self-drilling screws. If you don't see the self-drlling screw in our store below, contact us for a quick and fast quote.